In our last post, we saw that the size of the black powder grains are a significant factor in the rate of combustion of the powder and therefore, the pressure curve as well. In today's post, we will look at how powder grain sizes are classified in the US. 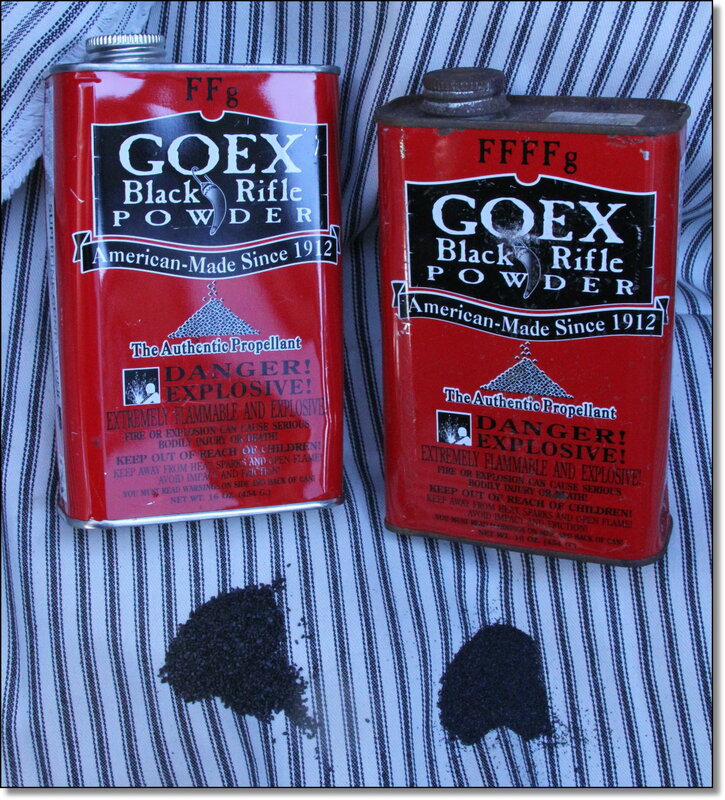 Two different grades of black powder. Click on the image to enlarge. The above image shows two cans of black powder of different grain sizes. Notice that on the top of the can on the left, we see the letters "FFg" and for the can on the right, we see the letters "FFFFg". Modern black powder purchased in the US since about the late 19th century, has been labeled with a combination of the letters F and g, for example Fg, FFg, FFFg etc. These indicate different grain sizes of powder and we'll see what this all means in a minute. The same grade is sometimes referred to by different names. For instance: "FFFg" grade is sometimes referred to as "3Fg", "3F", "FFF" etc. "A" or "blasting grade" powder - the preferred powder of choice for fireworks manufacture. "g" or "sporting grade" powder - preferred for firearms use. The primary difference between the 'A' and 'g' grades is in the manufacturing process. Both are manufactured in the same way initially, but at the end, the 'g' grade powders are polished in a tumbler with a tiny amount of graphite, to polish the grains and make them flow easily. The 'A' grade powders are not usually tumbled, and if they are tumbled, it is just for a short amount of time to remove any sharp edges. For purchasing the A-grade powder, the user will need to have a BATFE (Bureau of Alcohol, Tobacco, Firearms and Explosives) license and a BATFE-legal magazine to store the powder. Usually that is why it is not commonly seen in sporting goods stores and such. The g-grade is not subject to the same restrictions and is therefore available in gun stores and online shops (only need a BATFE license if purchasing more than 50 lbs. of g-grade powder). Notice that the two cans of black powder in the image above both end with the letter 'g' (One is labeled "FFg" and the other, "FFFFg"), which shows that these are intended mainly for firearms use. Now on to the mystery behind the letter 'F'. The letter 'F' stands for "Fine" and dates back to the time when the grains were designated F or C (for "coarse" grains). The number of times the letter F occurs in the powder grade shows the average size of the powder grains. The more times the letter F occurs in the name, the smaller the grains. What this means is that the size of "FFFg" grains are smaller than "FFg" grains, and "FFFFg" is even smaller than these two. When black powder is manufactured, the grains are sorted through sieves of standard sizes and classified that way. FFFFg 40 mesh 0.47 mm. FFFFFg 75 mesh 0.149 mm. Note that the first 3 grades are intended for use with cannon. The A-1 grade is generally used for artillery blanks used for firing gun salutes. Fg is made for using in large bore rifles and shotguns (8-gauge and larger). FFg powder is used for historical small arms such as muskets, fusils, rifles and large pistols. FFFg powder is for smaller caliber rifles (below .45 caliber), pistols, cap-and-ball revolvers, derringers etc. FFFFg and FFFFFg are mostly used as priming powder for flintlocks. In the image above, the two grades of powder were intended to be used in a historical re-enactment and the FFg powder was meant for the main powder charge of a flintlock rifle, while the FFFFg powder was intended to be used in the pan of the flintlock as a priming powder. Similarly, the A-grade powders are classified into various grain size ranges (FA, FFA, FFFA, FFFFA, FFFFFA, FFFFFFA, FFFFFFFA, Meal-D and Meal-F (Meal Fine) and Meal XF (Meal Extra-Fine)). However, since these A-grade powders are intended for fireworks and quarries, we will not study them here. In our next post, we will study the grain size classifications that were used in the UK in the 19th century.